Boating and Waterways Commission: A More Interactive Presence? 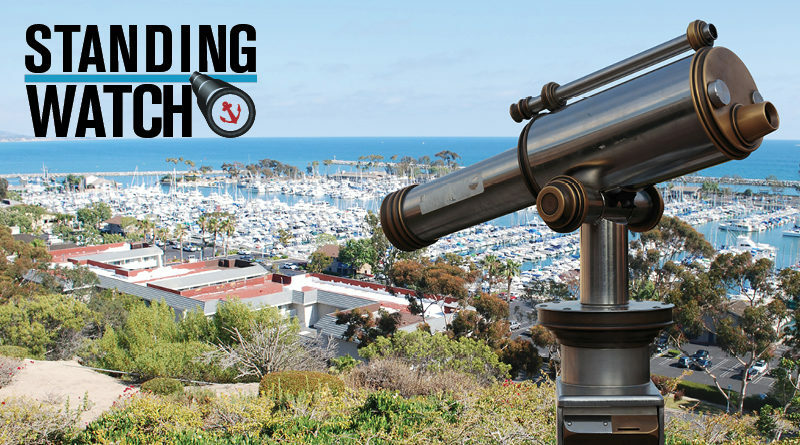 Commissioners, boaters, marina operators and harbor administrations could connect together through new committees. STATEWIDE — Four months between public meetings is a long time, but the California Boating and Waterways Commission is hoping to proactively interact with boaters despite formally convening only a few times each year. To be fair, the commission serves as an extension of the state’s Division of Boating and Waterways, meaning its function is primarily advisory. Boat launch ramp grants, private loans for local marinas and a variety of licensing or training programs often populate the commission’s meeting agenda. Yet the commission hopes to be enhancing its interaction with the boating public by the creation of several committees. Commissioners, boaters, law enforcement personnel, marina operators and harbor officials, with the aim of connecting the end user to Division of Boating and Waterways staff, would populate such committees. Commission Chair Randy Short told The Log he suggested the creation of a few committees at the advisory panel’s most recent meeting in April. The committees are: boaters; law enforcement; loans; public and private sector business; and, strategic communications. Short said he hoped boaters would become involved with the commission and division through the Boaters Committee, which would including yacht clubs, standup paddleboard groups, and the like. “That’s a way I see that we can really facilitate input from everyone that is a constituent of Boating and Waterways,” Short said about the Boaters Committee in a lengthy phone conversation about the state-level advisory body’s functionality. The other committees would likely focus on administrative and development functions of each marina or harbor. Members of the Public and Private Sector Business Committee, for example, would flesh out current and future developments of local marinas and harbors. The committee would be made up of small craft harbor or marina administrators and private sector representatives, among others. Meanwhile the Loan Committee would assist Boating and Waterways to determine the way loans would be structured. The Law Enforcement Committee would work with local harbor patrol or police while engineers, planners and environmental experts would sit on the Technical Advisory Committee to provide forward looking input. Long-range strategy would be vetted by the Strategic Communications Committee, which would be chaired by the commission’s vice-chair and conduct free-flowing meetings to discuss out-of-the-box concepts pertaining to the future of Boating and Waterways. Commission members would be assigned to individually chair a committee; those sitting on each entity would set meeting frequency. The commission is currently in process of filling committees with members. Cecily Harris chairs the Boaters Committee, according to Short. The Boating and Waterways Commission does not venture into the minutia of administrative issues. Instead the commission helps administer initiatives such as the boat brokers program and provides loans or grants for law enforcement or infrastructure projects (such as boat launch ramps). Maintaining public access to the water – be it at a lake or on the ocean – has also been one of the commission’s priorities, according to Short. The commission chair said about 95 percent of California boaters are not on the water, but instead would be found on a lakeshore or trailer. “Their access to water is through launch ramps,” Short said, adding the Division of Boating and Waterways has created launch ramps everywhere, usually funded by DBW money (and in some cases, built and rebuilt). Of course there is still work to be done – Short said he would like to see the public, both boating and general, use the commission to directly communicate with Boating and Waterways leadership. The commission itself is more accessible nowadays. Commission meetings are now broadcast live and available for later viewing on cal-span.org. The next public meeting is Aug. 15-16 in Fort Bragg; commissioners will tour Noyo Inner Harbor’s boat launch ramp on Aug. 15, followed by the formal meeting the next morning. Can the seven-member Boating and Waterways Commission be a vehicle for boaters to be heard at the state level? Can the Division of Boating and Waterways be a complementary agency to local boards of supervisors, city councils and harbor commissions? Reach out to commission members and let them know what they can do to make sure boaters are not a forgotten group in California. Take up Short’s invitation to become involved with the commission’s Boater Committee.